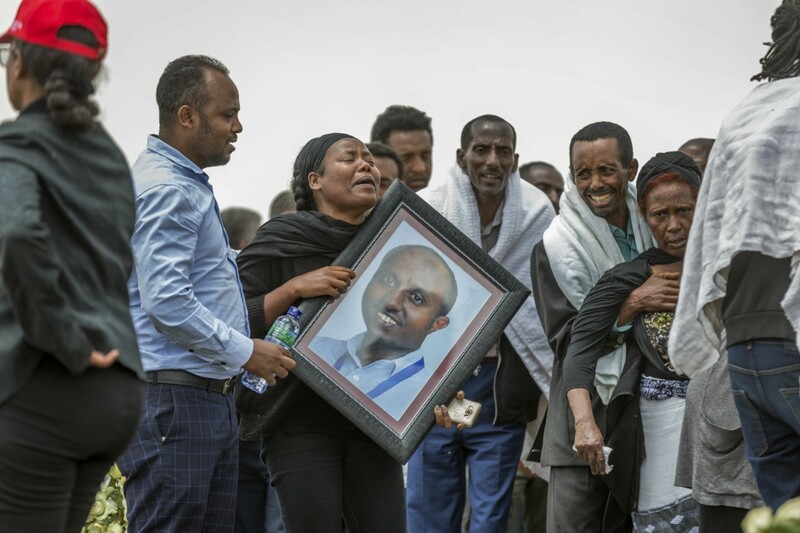 The families of the victims of Ethiopian Airlines Flight 302, have journeyed to the site of Sunday’s fatal accident, joining each other in making the site a sacred place of grieving. Relatives were seen staggering off the scene with sorrow, while others stood in silence. While the site has become a place of mourning it has also become a place where people are demanding answers. “We owe it to the families to understand what happened,” said British Ambassador Alastair McPhail. Officials say 157 people died last Sunday on the Boeing 737 Max 8 aircraft as it took off from Bole Airport in Addis Abbaba, Ethiopia at 8:38 AM on its way to Nairobi, Kenya. By 8:44 AM the plane crashed in a field outside of Bishoftu, Ethiopia. In that same field families are leaving photos, gifts, flowers and more all under a makeshift floral arch, reports the Associated Press. According to Reuters, 35 nationalities were on board the plane. Including, Nine Ethiopians, 32 Kenyans, 18 Canadians and eight people each from China and Italy. As yellow tape remains around the crash site, families met with Ethiopian airlines hoping to get answers on Thursday. Around 100 relatives of the victims walked out of the meeting due to lack of information on their loved ones. A Yemeni citizen Abdulmajid Shariff, 38, who lost his brother-in-law in the crash expressed his anger. “They called us to give us a report on bodies and the reasons for the crash but there was no information,” Shariff said. The airlines weren’t able to produce reports of bodies because the passengers remains have been charred due a fire during the crash. But this lack of information has left families uneasy. “I’m actually going home today because there is nothing here,” she said. Others became more frustrated because there were no bodies to bury, which goes against religious customs of many of the families. “Big families, a lot of people and the full Israeli nation is waiting for these remains and we will not go out of Ethiopia until we find the remains to bury them,” Moshi Biton of Israel, who lost his brother, Shimon Daniel Re’em Biton, told the Associated Press. For Muslims, a body must be buried as soon as possible and in the In the Ethiopian Orthodox church, bodies are to be buried a day after death. This is the second Boeing 737 Max 8 aircraft to crash in the last six months. The first happened in Indonesia when a Lion Air jet crashed near the capital Jakarta on Oct. 29, killing all 189 on board. All countries, including the United States operating with the Max 8 have banned the aircraft until further notice. The cause of the crash is still unknown.